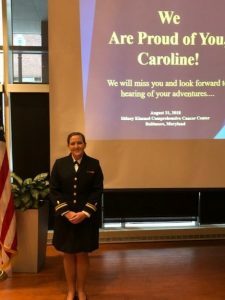 A United States Navy social worker finished up her training at Johns Hopkins Hospital and will be heading off to Japan to showcase her new knowledge and serve the country. Lt. j.g. Caroline Potter, LMSW, was honored during a ceremony inside the Weinberg Center for completing her training to advance her Maryland social work license. She will be stationed in Misawa, Japan, at the U.S. Naval Air Facility. During her advanced skills training, Potter authored a poster presented at the Society in Social Work Leadership in Health Care annual conference entitled “Psychosocial Screening for Medically Complex Treatments and Surgeries.” She presented the Kimmel BMT Psychosocial Screening tool used to identify domains which can directly impact the successful outcome of a BMT (Caregiver, Transportation, Finances, Housing, Insurance, Legal and Coping) and the process to establish early patient engagement in problem-solving to resolution. With increasing numbers of traumatic injuries and losses, life-changing wounds, battle fatigue, and other emotional and psychological issues related to combat, the military use licensed clinical social workers to help care for Navy personnel, Marines and their families on the battlefield, at hospitals abroad, and returning home. The Johns Hopkins Social Work Program was the first civilian collaborations in clinical training. The joint initiative began in September 2009 when former Kimmel Cancer Center and now Navy social worker, Cmdr. Joseph Ford, suggested to his superiors that his prior employer, Johns Hopkins, could be a potential civilian training site for Navy social workers. With the graduation of Potter, the Navy training program will close. Potter was the 17th graduate of the Health Services Collegiate Program for post-Master Social Work Fellowship. Congratulations.